So, I'm looking to upgrade from my 93 hatch to a new SI. 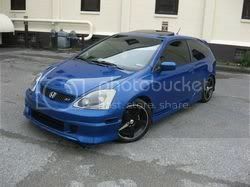 I was searching on Ebay yesterday and came across an 05 SI w/ mods. I noticed right away that the car had a front lip kit that wasn't shown in the list of modifications. I Emailed the seller and he would only tell me that it was the stock bumper with a lip kit. So far, he has refused to tell me what kind of lip it is. I was actually thinking about making a serious bid on his car until he failed to answer such a simple question. It makes me wonder what else he isn't willing to tell people about his car. 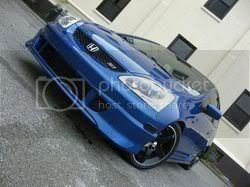 Regardless, I'm going to end up buying a new SI at some point, and I'd like this front lip. The only problem is that I just can't find it anywhere! I have searched Ebay, Google, ProCivic, etc etc etc. and I can't find a lip kit like this anywhere. Please help me identify this lip kit with a link to purchase it!